Put simply, multi-channel attribution is giving relative credit to the channels which played a part in securing a conversion. For example, in a soccer match, we have the goal keeper, defenders, mid fielders, and strikers. When the team scores a goal, we can attribute equal credit to each player. We can also attribute different credit values to each player, depending on the importance of their roles. For example, if the goal keeper kicked off the ball and the team scored, he would get 100% credit if we used a first-touch attribution based model. 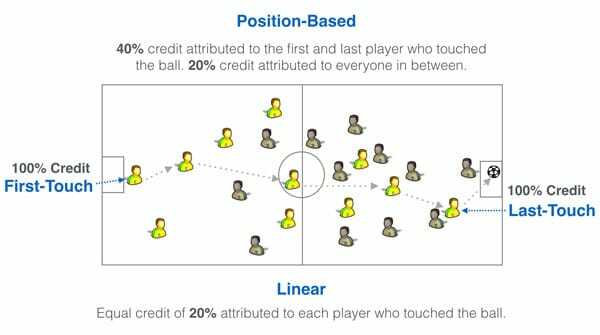 If we used the linear attribution model, each soccer player who touched the ball would get equal credit. The first marketing effort gets 100% of the credit. Allows you to find out which marketing effort drove brand awareness and lead to the conversion . But is biased towards other channels which played a part in the conversion. The simplest of multi-channel attribution models, Linear attributes equal credit to every channel that played a role in the conversion. This makes it difficult to assign budgets according to the importance of various channels. “Direct” data is often reported when a visitor doesn’t have any referral source (e.g. social ads, untagged email links). This attribution model ignores all direct traffic (i.e. if a visitor enters the URL directly in the browser) and attributes 100% credit to the last channel the visitor interacted with. This model is also known as the U-shape model, where 40% credit is attributed to each the first and last marketing effort, and 20% credit is distributed evenly to the rest of the channels in between. This signifies the importance of the first and last interaction channel in the journey. Attributes 100% credit to the marketing effort that drove the conversion within a window period of say 90 days. Easily discredits other marketing channels that also contributed toward the conversion. The Time Decay attribution model attributes the least credit to the first touch point and the most credit to the final touch point. This assumes that the last marketing effort had the most influence in the conversion, but ignores the influence of the first marketing channel. This attribution model credits 100% credit to the last touch/click of whichever channel you specify (e.g. Facebook, AdWords). For AdWords, if your ad was clicked on for two search terms, the last search term, in this case the second search term would receive 100% of the credit. This attribution model will require a data scientist to analyse the entire buying process and develop an algorithmic attribution model to match the customer journey to it. It requires the most time and effort to build and maintain, but can provide the most accurate representation of attribution data. Multi-channel attribution allows you to credit all digital marketing channels involved in driving conversions. The credit value (attribution amount e.g. 0.1 – 1.0) is dependent on the significance of the channel in influencing the conversions. To learn more about multi-channel attributions, sign up for our Digital & Web Analytics (Google Analytics) training course.